After working retail, odds jobs and beginning my journey as a freelancer I saved up enough money to get my first apartment. My original plan was to move out of state, but after realizing how financially and mentally hard it would be to move to a state where I had no family, friends or a job I reasoned moving to another city would be a great baby step. In getting my own place I've had a lot of fun as well as growth. 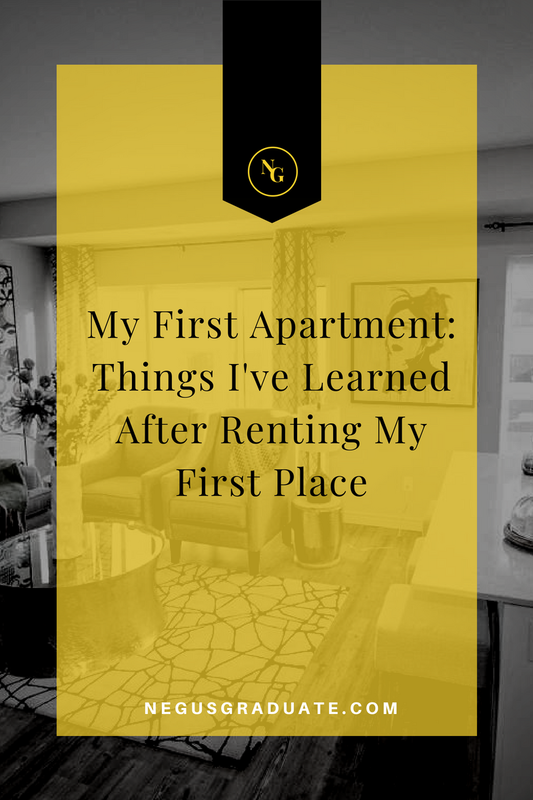 If you're thinking about getting an apartment for the first time here are a few things I learned that can be helpful knowing before you make that step. If you want a lease shorter than 12 months make sure you find out if there will be a price difference. Some apartments I viewed would have been an extra $200 on top of the original price for a shorter lease. Not all apartments work this way. I found an apartment that allowed me to lease for 6 months at no extra expense. The policy states if I decide to renew I need to turn the paperwork in before a certain date or an extra $20 will be added to my rent. Monthly leasing is also an option. This is a great for someone who is unsure how long they will be in a certain place. It's important to know your options before looking and the apartment policies before signing. Most apartments I've visited rented by young people have little to no furniture and I see why. You need credit to buy it sometimes. Even cute pillows can start at $16. You can use cheaper methods such as buy from garage sales or apps like OfferUp. Family is also an option. I was blessed that my family gave me my bedroom furniture and they bought what I didn't have. I only paid for the insurance on my table and sofa which was around $200. My family had me covered on the furniture, I had $4,000 saved and I was told my first month of rent was free. Great! But I still ended up spending a little over $1,000 just to move in. Things I paid for include: application, security deposit, WiFi, WiFi installment fee, water installment fee and groceries. It costed me $250 to get the water "installed". I regret not trying to get the fee waived since my apartment came with running water and all they did was switch over the payment to my name. Always at least try to get a fee waived especially if the payment doesn't make sense. When the only thing that separates you and someone else is a wall sometimes their business becomes yours whether you want it to or not. Within the third week of living on my own I was awakened by a loud noise and the shaking of the wall behind my bed. I later found out it was a drug raid. Since then, more uncomfortable incidents have occurred. I like the neighborhood I live in. Ironically it's on what is considered the good side of town and surrounding areas are usually quite. It's just my neighbors that have annoyed me. I enjoy minding my own business but when the cops are right outside my place or I hear what may be domestic violence it's not easy to ignore. Unfortunately, unlike other things you can check out firsthand while apartment hunting; you never really know who you're living by until you live there. The best thing you can do is pick a good neighborhood (I've learned sometimes that doesn't matter) and hope for the best. In my apartment visitor parking is limited to 4 spots that are far away from my unit. When someone parks in your spot all hell breaks loose. I get it; it's hard finding another spot and it can cause a domino effect if you park in someone else's spot, but these people are intense. I've had someone park in the street so that they can block me in to teach me a lesson. I've also seen two people curse each other out after someone decided to leave a passive aggressive note on a car about not parking in their spot. It was heated. For my next apartment I will definitely pay more attention to parking availability. Make sure you ALWAYS read your lease agreement. You need to know when it ends. Turns out when I renewed my lease for 12 months when I thought it was another 6 month agreement. I should have been more adamant about wanting 6 months and double checked the paperwork. You also need to know what happens if you break the lease. In my case I'd have to pay ALL of the remaining months of rent, but some apartments aren't so harsh about that. Some landlords might only want a little money. Others might be so desperate for space they allow you to break your lease without any costs. It doesn't hurt to ask. You'll feel better about spending X amount of money monthly if you know your needs are being met. I could have a cheaper place, but you get what you pay for. I enjoy places that offer a lot to do and jobs, but I also value peace and quite which is why I stay 20 minutes away from downtown. I have big furniture and I do well mentally when I'm not surrounded by clutter (I'm a baby minimalist) so I need space. I live alone because after living at home and dorm life I thought it was time, plus I love my friends but I'm not sure if any of us should live together. All of these factors in to why my rent is as expensive as it is and how I went about my apartment hunting process. All of your needs might not be met but it's important to make sure you're getting your money's worth. Before I moved I did a bunch of research on getting my first apartment. I learned that getting an apartment with large windows will help lower the light bill by using natural light. My highest light bill was $60. In the winter I used an electric blanket instead of running the heat. Instead of cable I use my WiFi and smart TV to watch my favorite shows for cheap. I use my family's cable provider information to get HBO Go (for Insecure), my mom's Netflix account and I pay for Amazon Prime Video. This means I'm only paying $9 monthly for entertainment. When choosing my WiFi provider I went with what my area had to offer and then which package was the cheapest with the amount I needed. It's been a year since I've had my own apartment. haven't landed a traditional job like I had hoped I would once I moved here so I haven't been able to save, but I've gained in other ways. I have a community of great friends that teach me about life from many angles, I try new things with and are there for support. My family sees me as more of an adult so our relationship has improved. I've learned more about how to prioritize my spending and making it stretch. I've learned a ton of things about myself which has helped improve my decision making. I enjoy inviting people over when I want and being alone when I want. Moving here has given me the space I needed to think, become my own person without so many outside voices and my productivity increased immediately. Also I really love that it's okay if I'm too tired to clean or don't feel like wearing pants. I think I made the right choice by getting my first apartment in my home state before moving away. I imagine learning these lessons would be much harder if I was in an new place without a support system. I'm not sure when I will make my big move out of state. There are still some things I need to learn while I'm here, but I do feel more prepared to make that move than I did a year ago. In the meanwhile I'm learning to enjoy the journey.